If you're having problems with your server timing out, 'going away', producing blank pages or giving you '500 Internal Error' messages during the conversion process you can do it offline on your own PC (or Mac - explained at the end) instead. 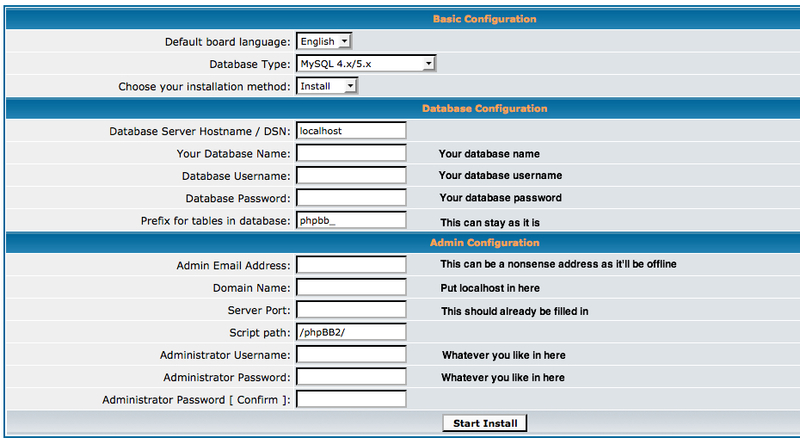 Firstly you need to install several components which make it possible for the forum to work (php, MySQL, phpMyAdmin). Luckily these are available in a 1-click installation application. The main two that people tend to favour are easyPHP1.8 and XAMPP. As I'm most familiar with easyphp I'll explain how that one works. Please note, this tutorial is written for v1.8 NOT v2.0 beta as that does not work properly. This will make a folder in C:\Program Files\EasyPHP1-8 called www. That's important and we'll come back to it in a minute. Right click the e and select configuration>phpMyAdmin which will launch the database manager phpMyAdmin in your browser window. In the box below that give your database a name (let's call it 'test') and click create. You have now made a database! By default, the username is root with no password. This will be important in a moment. Now, it's no use having a database without something to put in it, so lets install phpBB2 on your PC as well. Download it from phpBB.com (or get a full download of your own forum folder and edit the config.php file accordingly - but for the purposes of this we'll assume it's a fresh install) and put the decompressed forum folder in the EasyPHP1-8\www folder I mentioned earlier. Now, right click the e and select Local Web. You'll see an easyPHP page showing the folders in the server root ("www") folder. ie the phpBB2 folder you've put in there. Click that and you'll see the regular phpBB2 installation page. Rename or delete the /install and /contrib folders in the www/phpBB2 folder and click finish installation. You now have phpBB2 installed on your PC. But, in order to do the conversion you need your board database in there. On the board, switch your own style back to subSilver as it save a lot of messing around later. Make a database backup from the server, as explained in this KB article. Next, make a folder in www/phpBB2 called 'dump' and put the database backup .sql file into it. Go here and download BigDump. This is an application that helps you easily restore large databases. Open the BigDump.php file in wordpad or notepad. Enter the database name (that you made at the start), the username is root and there is no password so leave that field as it is. You'll see a window listing the database name. Click start and it'll restore it for you into phpMyAdmin. You now have your forum installed on your own PC. You'll have to run the cookie fix script if you want to check it over but it should be fine. Now download phpBB3 and follow the same steps as above to install that in the /www folder but give it a different database name. At the end of the phpBB3 installation it will ask you if you want to run the converter. Choose that and on the conversion page it will ask you for information about the phpBB2 installation. Most of this information is what you entered when you made it earlier. It's also in the config.php file. It should now run the conversion and at the end you'll be looking at a phpBB3 version of your old board! Now, using phpMyAdmin again (right click the e and select configuration>phpMyAdmin) export the newly made phpBB3 database as explained above. You can now put this new database onto the server in your online phpBB3 installation. Just follow the same BigDump instructions above, ensuring your enter the online database information (in the online phpBB3 installation config.php file). Upload the .sql file to the server into a folder called BigDump, navigate to the bigdump.php file online and it will restore the database. You now have your new phpBB3 online board with your converted phpBB2 database. For Mac users the equivalent of easyPHP et al is MAMP. It will install a MAMP folder in /Applications. phpMyAdmin is accessed through the start page button. By default, Apache runs on Port 8888 and MySQL on Port 8889. You can change the ports at any time in the Settings/Ports menu of MAMP (but you shouldn't need to). Remember this when you're on the phpBB install page. Download phpBB and put the phpBB folder into Applications/MAMP/htdocs. https://localhost:8888/phpBB2 and you will see the installation screen. The rest of the instructions are pretty much the same as for the PC.